Are you a new or returning skate skier looking for tips and inspiration before hitting the trails? Mastering skate skiing means learning a collection of techniques – Free skate as the foundation, one skate for acceleration, two skate for cruising, offset for moderate hills, and diagonal skate to conserve energy on longer, tougher hills. If you are a visual learner (and many of us are) you can get a lot out of viewing online technique demonstrations while hearing about the principles of propulsion. For one video that covers a whole range of skate techniques in a little over 8 minutes, check out the video by Saul Goldman, founder of Velotique, a ski and bike store on Queen Street East. Remember that good skate technique relies on power from the legs, so any dryland leg strengthening workout will help you prepare. When you arrive at a ski destination, you’ll be glad you put some effort into getting ready. This entry was posted in Tips, Uncategorized, XC Skiing on December 30, 2015 by trakkers. Will you be ready to ski well when the snow arrives? Reviewing some basic how-tos can remind you of what it takes to get good propulsion on the trails. We asked Trakkers Ski School Coordinator Steve Favell to suggest a video for us to watch to brush up on classic or diagonal stride ski technique. Steve’s pick is one provided by CANSI (The Canadian Association of Nordic Ski Instructors) that features Keith Nichol, a Level 4 CANSI instructor. This video includes some of the technique improvement drills used by Trakkers ski instructors during ski lessons. Also popular with Trakkers members are the tips given by well-known skier Saul Goldman, founder of Velotique, a ski and bike store on Queen Street East. Check out the first 4 minutes or so if this video, filmed at Hardwood Ski and Bike, one of the club’s destinations. Here, Saul carefully explains the dynamics of the diagonal stride technique. And here’s a very thorough video with quotes from some of Canada’s best skiers. It includes good tips on climbing hills at the end. Stay tuned for more skiing tips! This entry was posted in Tips, XC Skiing on December 22, 2015 by trakkers. Trakkers Sunday bus trips offer a relaxing way to get to some of Southern Ontario’s best cross country ski and snowshoe destinations. Passengers take what they think they will need for the day onto the bus in a sports bag or backpack. We asked a few long-time members for their tips on what to bring for an enjoyable day trip. Steve’s suggestion is to take different pairs of flexible wind-proof gloves (light ones for mild parts of the day and vigorous activity and a warmer pair for when the cold winds blow). Barb agrees and recommends the same with hats – a warm one for frigid temperatures and a lighter one for high energy skiing in moderate weather. Karen reminds us to bring sunglasses for those brilliant, cloudless days along with sun screen and lip balm. Energy or granola bars can be brought along on the trails in case you need them. Bring your lunch or you can buy it at most of our destinations. A slim money pouch or thin wallet for essential valuables that you can keep with you on the trails is another good idea. Keep in mind that skiing warms you up quickly so take thin layers that you can add or remove easily. Breathable synthetic or wool clothing is best. Paula brings a big warm coat to get from home to the bus and back. She leaves it on the bus during the day. Your ski or snowshoe workout may leave you damp and sweaty for the ride back to the city. Avoid this by bringing a pair of dry socks and a cozy top to change into for the journey home. And for that ride home …. Karen suggests a newspaper, book or knitting. This is the time to indulge in a special treat. “I sometimes bring a thermos of hot chocolate with maybe a drop of Bailey’s Irish Cream for the bus ride back!” says Paula. This entry was posted in Sunday Trips, Tips on December 15, 2015 by trakkers. Lots of info to share this month, including a report-back from our Open House, new 8:00 a.m. Sunday TTC subway start, a joint extended trip with the Halton Outdoor Club, and confirmed date for our annual Wine and Cheese. Our first trip is still tentatively planned for December 27 to go to Hardwood Hills. We are obsessively monitoring the extended weather forecast, but if everyone could please do a daily snow dance that would be really appreciated! Open House Recap — We LOVE Winter! 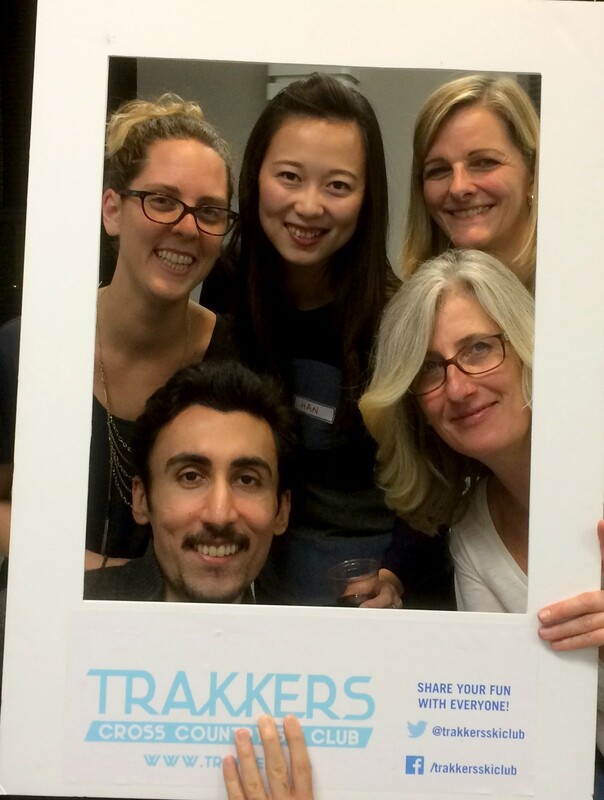 The November 20 Trakkers Open House was well-attended and it was wonderful to see so many returning and new members join us. Our Ski School and Sunday Trips tables were pretty well mobbed all night with new prospective members asking lots of questions. As of December 13, the club has 164 paid members, so we are well on track to hit our goal of 200 members again this season! At the Open House we also launched our “LOVE Winter” campaign with a Trakkers selfie photo booth, the results of which we’re showcasing through our Facebook page through November and December. Share out your faves to help spread the word about the club! Subway to Start at 8:00 a.m. on Sundays! Trakkers members now have an even more convenient (and faster) option to get to our Sunday Trips pick-up location — just don’t forget that our bus still leaves at 9:00 a.m. sharp! New Extended Trip Option — Sault Ste. Marie with Halton Outdoor Club! Trakkers is pleased to announce that we are able to offer an all-inclusive longer trip option to Sault Ste. Marie through the Halton Outdoor Club. Trip dates are Wednesday, March 2nd to Sunday, March 6th, 2016. The trip is suitable for all levels of skiing (includes optional Wapos Loppet on March 5) and snowshoeing. Skiing is available from two locations: Stokely Creek Ski Centre and Hiawatha Highlands. Snow comes to this region early and stays late thanks to the lake effect of Lake Superior. The famous Stokely Creek Ski Touring Centre is located 55 minutes from the hotel, and features some of the finest skiing in North America on 110 km of groomed and track set trails through some of the most beautiful and varied skiing terrain anywhere. There are 55 km of skate ski trails, 25 km of snowshoe trail and, of course, all of these trails offer a great variety of terrain, from easy to difficult. This area features panoramic views of the Algoma Highlands and Havilland Bay on Lake Superior’s Eastern shore. Kinsmen Park (Hiawatha Highlands), located 15 minutes away by bus from the hotel, features 45 km of trails for classical and skate skiing, set in breath-taking scenery, as well as 8 km of snow shoe trails. This area features beautiful pine trees and magnificent views of ice falls. The package includes the following: return transportation by luxury coach from Burlington, cross-country skiing for 4 days including transportation to the ski areas, accommodation for four nights, four breakfasts, two dinners, one lunch on the final day, use of all hotel facilities, and all taxes and gratuities. To reserve your spot, or for more information, contact Barb Woods, our Sunday Trips Coordinator at weekendtrips@trakkers.ca. Trakkers hosts our annual Wine and Cheese on Sunday, January 10 at Scenic Caves. This is a great opportunity for new members to meet others in the club and for returning members to reconnect! We have the cute log cabin at Scenic Caves booked for the event. Light refreshments will be served around 3:15 to allow for plenty of time to socialize before our bus departure at 4:00 p.m. Spots Still Available for Weekend Trips! Keep on trakkin — we are potentially 2 weeks out from our first Sunday trip! And don’t forget to follow us on Facebook and Twitter for the latest updates! This entry was posted in President's Blogs on December 13, 2015 by trakkers.